Add chopped onion, cook till slightly cooked. do not brown them. Add chopped tomato and cook till nicely cooked. You dont want raw smell of tomatoes. For heat oil for tempering add musterd seeds, once cracked add curry leaves, whole red chilli and heeng. Serve with Doda Udly Vada or Upma. Note: This chutney can be made without onion just skip adding onion and add 3 tomatoes instead of 2. 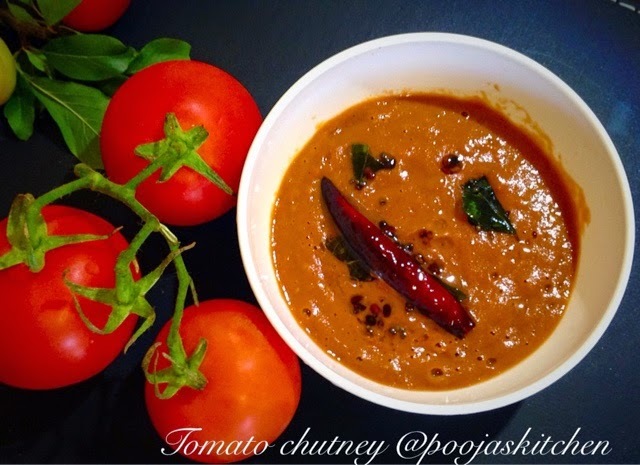 Hi Pooja..does this tomato chutney do not require salt ?